RIO DE JANEIRO, BRAZIL – Board members of Brazil’s Single Federation of Oil Workers (Federação Única dos Petroleiros or FUP) have unanimously accepted a sweetened wage offer put forward by Brazil’s state-led oil giant Petrobras. The decision means an oil workers’ strike, scheduled to start on October 11th, may be averted. The FUP protest in front of the headquarters of ANP, photo by Federação Única dos Petroleiros. In a statement released late Friday, October 5th, the FUP said the improved offer would see workers earn a pay increase of between 7.51 percent and 8.2 percent, or a real gain of between 2.16 percent and 2.77 percent, once inflation was taken in account. The FUP will now recommend its constituent unions to accept the improved Petrobras offer, the federation statement said. Unions are meeting this week to assess the proposal. The deal also includes payment for oil workers who carry out shift work on November 15th, the date Brazil was declared a republic in 1889 and now a national holiday. During earlier negotiations, the FUP had called for ten percent wage increase, while Petrobras originally offered 6.5 percent. 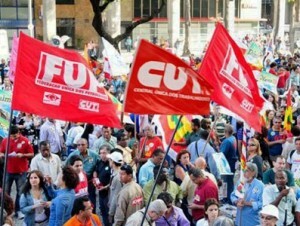 The FUP is an umbrella organization that negotiates on behalf of twelve affiliated unions across Brazil. These in turn represent nearly 60,000 of Petrobras’ 75,000 employees. Last Wednesday, October 3rd, Petrobras oil workers demonstrated for higher wages in front of Brazil’s National Petroleum Agency (ANP) in Centro, Rio de Janeiro. The FUP said in a statement that the demonstration, timed to coincide with the 59th anniversary of the founding of Petrobras, was also designed to push for Brazil to retain state control of its oil industry. The Brazilian government announced last month that it will restart oil exploration rights auctions in 2013, ending a five-year hiatus that has complicated the investment decisions of many oil companies operating in Brazil. Petrobras oil platforms and refineries can handle a strike for about seven days before minimal staffing starts impacting on oil output, a former company manager told Reuters last month. Petrobras workers are demanding higher salaries, photo by AGÊNCIA PETROBRAS. Jim Kappeler, an American expatriate living in Rio and working in the oil industry, explained that the strike action – by traditionally nationalistic unions – does not effect the multinationals here directly. 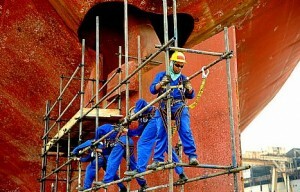 A report in May 2012 showed the average salary of workers in Brazil’s oil and gas industry rose 27.6 percent to R$215,000 (US$106,000) per year, between October 2010 and October 2011, a recent report by the recruitment agency Hays affirmed. The report placed Brazil and Australia ahead of 51 other countries which formed part of the study, saying the wages were on a par with those in the United States. “Brazil is at the crest of a wave. I believe that this level will rise or remain stable, at the least, in the coming years,” Matt Underhill who was responsible for the research. Brazilian oil workers gave Petrobras a warning last month during the ongoing wage dispute, holding a 24-hour nationwide strike aimed at forcing the company to boost its wage offer. The demands for higher wages come amid a massive US$237 billion five-year investment plan at Petrobras. The company also recently reported its first quarterly loss in over a decade.